The NFWI is a founding member of The Climate Coalition (TCC), the UK’s largest group of people dedicated to action on climate change and limiting its impact on the people, places and life we love at home in the UK and around the world. The aim of Show the Love is to start a conversation about climate change and over the years members have made and shared green hearts with their local MP, held green heart themed meetings and joined forces with other community groups to organise public events. See a selection of images and learn more about the NFWI's climate change campaign. Download the 2019 Show the Love community pack. 1. Share a green heart to start a conversation about climate change – get creative and make a green heart badge using our felt heart guide on page 7 of the community pack or our sustainable rag rug heart guide which uses scrap pieces of fabric (which can be downloaded below). 2. Make green heart bunting to share with your community – make green heart bunting and use your bunting to ‘green heart bomb’ somewhere in the heart of your community to encourage people to ask what the green heart symbolises. Find out more about bunting on page 10 of the community pack. 3. Craft a green heart for your MP – when crafting your green heart badges, save one for your MP to send along with the postcard included in the community pack on page 8 or download the postcard. Look out for your February issue of WI Life where the postcard will also be included in your inserts! 4. 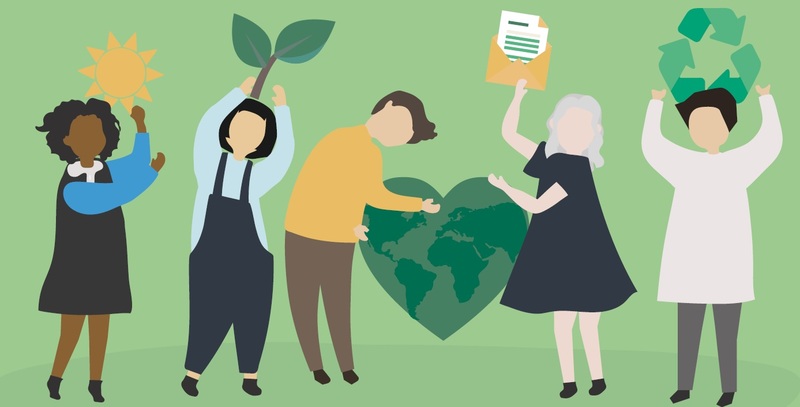 Theme your WI meeting around green hearts – hold a best green heart competition or invite climate change speakers to talk about the impacts in your local area, for more ideas see page 5 of the community pack.